It was on one of those cookbook work breaks when I flipped to a Frankies Spuntino recipe in Genius Recipes and almost ran home at that exact moment to make it. Frankies has a special place in my heart, both for really good food and a really great date night B2 and I had a few summers back — one of those evenings where the late golden light stays suspended in the sky way longer than seems reasonable, and you think there’s going to be a wait but there magically is none, and you stuff yourself full of crostini, fat rigatoni, and chewy gnocchi, and totter home feeling like this is what New York summers are made of. So there was no doubt in my mind that this recipe would be a great one, just waiting to be made in commemoration of that happy buzz from a good dinner under twinkling lights on an outdoor patio. The recipe is a quick and almost impossibly easy one for Caesar dressing, aptly described as “heretical,” yet “fiercely convenient.” It cuts out whisking and emulsifying and raw egg and anxiety and sweat in favor of a blender and everything you probably already have in your fridge, but without sacrificing an ounce of flavor. 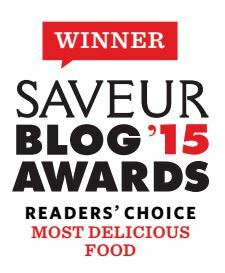 Between this and Molly’s dill hollandaise, I’m so very sold on blender dressings — it’s none of the hassle for all of the same (if not better) results. 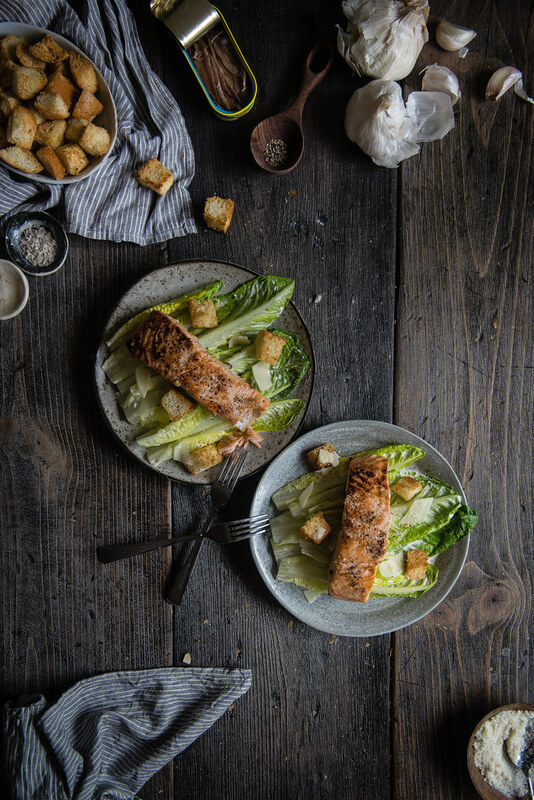 Though all this dressing really needs is a heart or two of romaine, I sliced up a few day-old kaiser rolls to make crunchy croutons to throw on top, and pan-seared a little salmon with some salt, pepper, and lemon to add heft. Everything about this is simple, with no unnecessary frills. 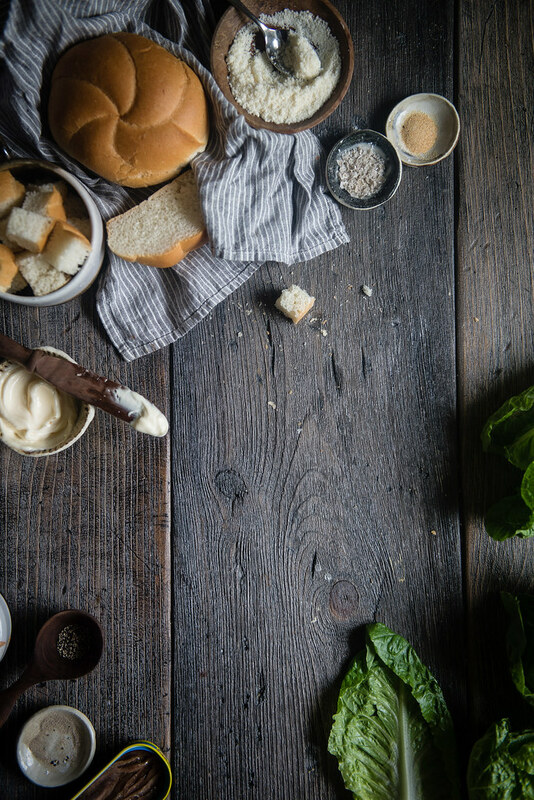 And the result is everything I’d ever want from a Caesar salad — the dressing is gently briny, just the right amount of salty and pungent, but with a comforting creaminess underlying it all. 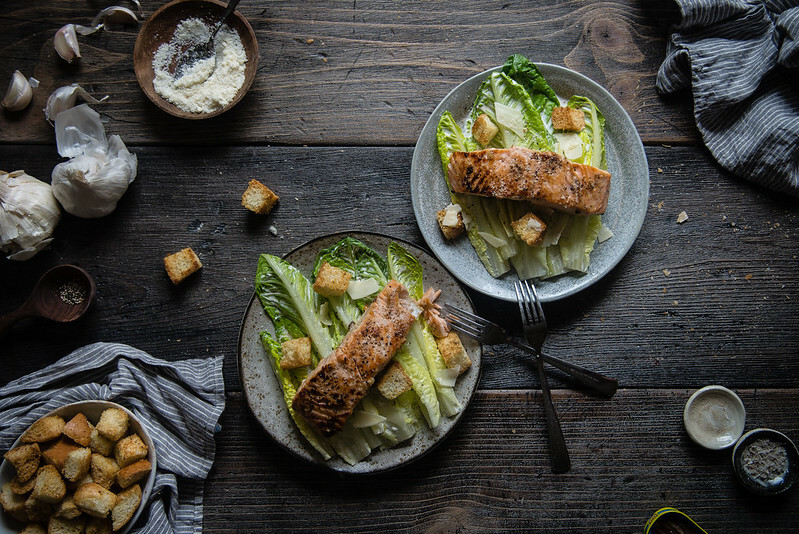 Buttery salmon gives the sardines a little company, and garlicky, faintly cheesy croutons pair up neatly with the Pecorino Romano. All in all, it fits right into the quick and refreshing, but still delightful, series of summer lunches we’ve been having lately. Hope you’re staying cool and having wonderful Wednesdays! This paragon of blender-dressing genius is scaled down from Food52 Genius Recipes and Frankies Spuntino. 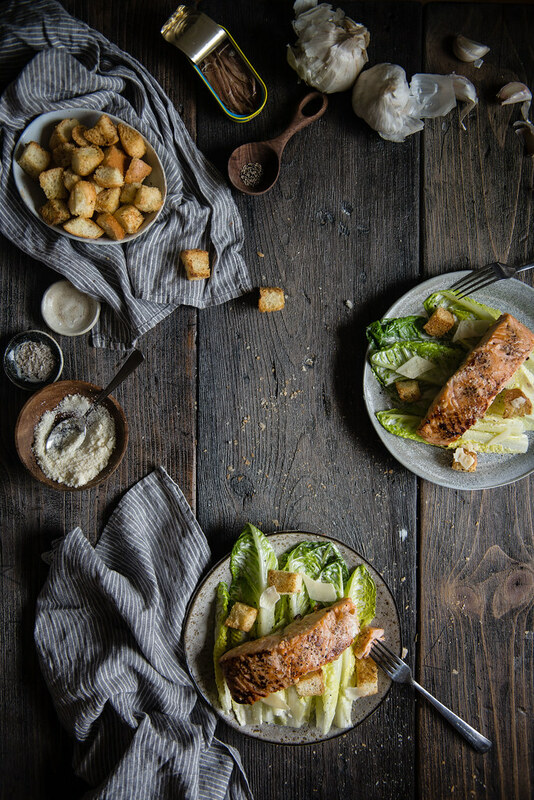 If you can bear fifteen minutes with the oven, the homemade croutons are a breeze, and a quick sear of some salmon adds staying power. If you're icked out by too much fish-on-fish, I think some grilled shrimp would be amazing here too, or a good old BSCB. To make the croutons: Preheat oven to 350 degrees. Toss diced bread in olive oil until evenly coated, then spread on a parchment- or foil-lined baking sheet. Season generously with salt, pepper, Parmesan, and garlic powder, then bake for 10-15 minutes, stirring once, until sides are golden. Set aside and let cool. To make the salmon: Pat fillets dry on both sides, paying special attention to the skin-side if you're leaving it on. (I do because I love me some crispy salmon skin.) Season generously on both sides with salt and pepper. Heat the olive oil in a skillet over medium heat. Add the garlic and salmon, skin-side down (if applicable). Cook about 4-5 minutes, until skin is crispy, then flip and cook the other side for another 4-5 minutes, until fish flakes easily. Try not to flip more than once. Sprinkle with lemon juice and set aside to let cool briefly. Next, trim the root ends from the romaine, separate the leaves, and wash and dry them. Put the lettuce in the fridge to chill while you prepare the dressing. To make the dressing: In a blender or food processor, combine all ingredients for the dressing except the salt and black pepper, and puree until smooth. If you don’t have a blender or food processor, simply mince the garlic and anchovy as finely as you can, then whisk them with the remaining ingredients. Taste and adjust with salt to taste -- the ingredients have a fair amount of salt, so you likely will not need any. Loosen the dressing with more water if needed. Set aside. Toss the chilled lettuce with the dressing in a large bowl. Serve immediately with croutons, salmon, more grated cheese, and a turn of black pepper. This looks like it would be amazing with grilled romaine. Thanks for sharing another stunning dish! Oh my gosh, what a genius idea!! Grilled romaine sounds incredible. I thought I had the perfect recipe for Caesar salad but I am not so sure anymore. I am going to make this salad for a dinner this weekend. Thank you ! Ooh, is it the one on your blog? That looks fabulous — now I’m tempted to stray from what I was convinced was the end-all-be-all! I made the Caesar salad last weekend and it was delicious. I served it for lunch with salmon cakes. Congrats on your new office! That’s exciting. I remember my first job I had a little cubicle out on the floor but I was still SO excited to personalize it. I was only there for a year so I knew I couldn’t go crazy, but I still ended up with a ledge full of various teas, including a matcha whisk (which prompted many conversations, hehe), and definitely cookbooks. They are indeed a great little escape from office life :). I’m loving this summer lunch series – great inspiration for these hot and humid days! Between this and Orangette’s Caesar dressing I am craving Caesar salad something fierce right now. Yum. Congratulations, by the way, on your own office! I do not have an office job, but if I did (and if I felt bold enough to) I would stash cookbooks there as well. Woohoo on the new office! I think it’s always nice to make an office space homier, although I would probably be very distracted if I had cookbooks that close to me at work! That salmon looks perfectly cooked and yes, all hail blender dressing. Now I’m craving crunchy romaine lettuce! You’re so cute, decorating your office with your cookbooks! I don’t think I could get away with that here — my company, like every friggin tech company ever, has an open floor plan (which I have mixed feelings about but whatever) and everybody can just see the clutter on my desk all the time. Sigh. This is gorgeous and perfect for summer. I love salmon any and every way, so this is massively attractive to me. Throw in a a fancy salad dressing, and I’m yours. I can’t wait to give this beauty a try! And congrats on the new office! That’s so awesome! This sounds so salty and tangy in the best possible way ever! I love how beautiful it is too! And those croutons, gahhh love ALL of it. Oh goodness, NOW I know exactly what I want for lunch! I don’t know Frankie, but I think I love him. <3 Beautiful as always! Egg free caesar dressing, THANK YOU! I know I should probably get over my raw egg phobia, but I don’t see that happening as quickly as I want to eat caesar salad. I have my own version of an egg free caesar dressing but I really like your addition of red wine vinegar. I think that will be really nice. Thanks for sharing and as always, stunning photos. P.S. congrats on your office upgrade. Your decorations sound charming. Love how easy this dressing it – but it still looks totally packed with flavour! 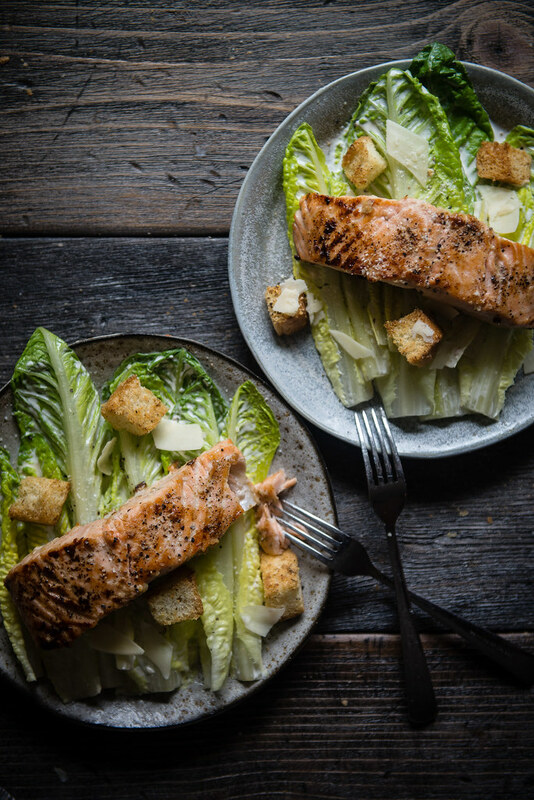 And salmon is amazing – so much better than chicken in caesar salad in my opinion. 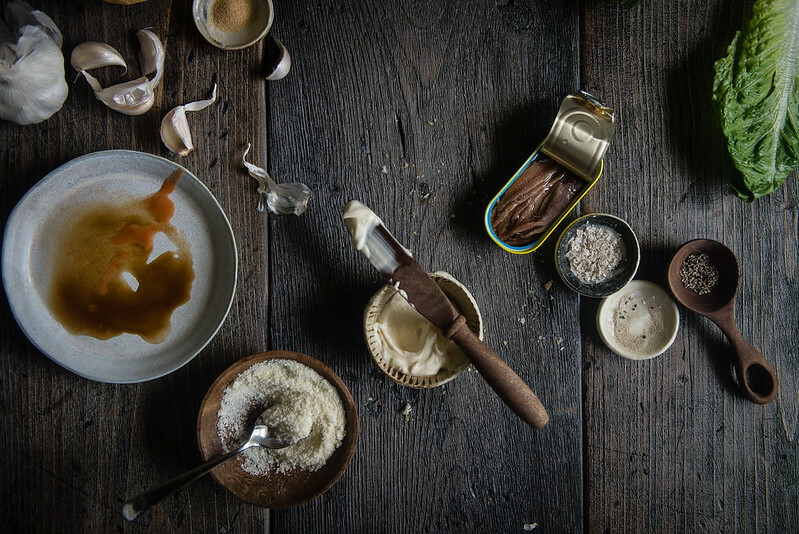 Gorgeous food styling too, always. Awesome! Congratulations on your new space, woohoo! I bet it’s as cute as can be since you’re so creative and artistic. And this looks simply amazing, and vice versa. I was never much of a Caesar person but now I actually enjoy the taste, ever since Greg made me Caesar salad ALL OUTTA SCRATCH some years ago for Valentines, hahha! It was such a pleasant and errrr once in a blue moon kind of surprise so it stuck with me, lol. 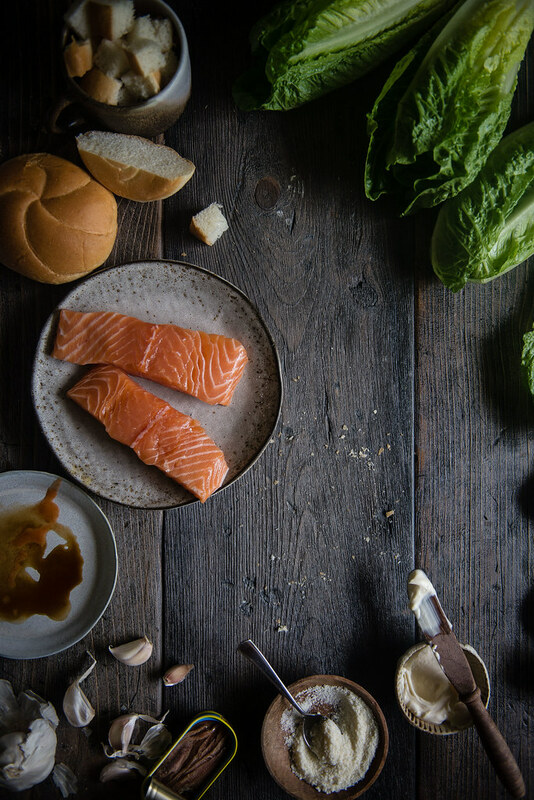 This salad looks so good, especially with the salmon! 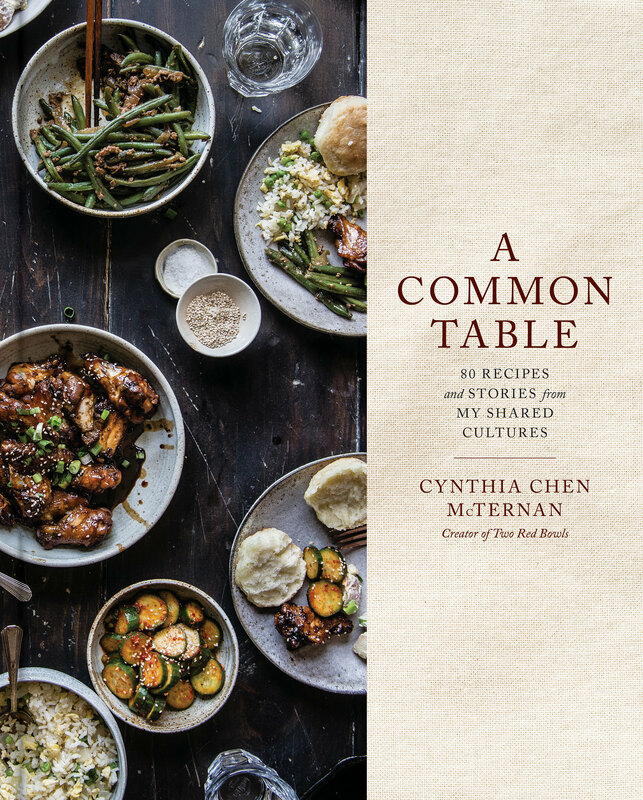 I always love your recipes Cynthia, they’re so on point every time. We had a similar experience to your’s last summer at Frankies. Got there, no wait, seated in the patio, perfect weather, watched the sun go down while enjoying amazing food. Ah, so good. Unfortunately we haven’t been seated in the patio (if we can even get a seat without waiting 2 hours) this year since they seem to have a wedding out back every day. Gah! I want to tell people to stop getting married at Frankies. Anyways, love this! I recently pre-order the Food52 Vegan cookbook and I am hoping it has a Caesar salad recipe like this! I simple love your photos and your style. The shadow play and dark background always catch my eye. Um, YUM. This looks amazing. I’m a fan of the idea of a simple, yet flavorful salad to cut out the necessity of much stove/oven business. Omg. Cynthia!! This is so good. I have made a Caesar salad dressing the old school way before but I like this way so much better. Maybe it’s just the poetic way you described it or that you paired it up with that hunky salmon?(!!!). I can’t decide. But I’m alll over this.